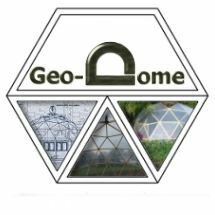 Sometimes there is a need to move away from the circular plan of a standard dome for example when you need to cover something like a swimming pool or rectangle shaped beds in the garden. I’ve had a lot of enquiries about elliptical dome designs but haven’t done one because they’re a total nightmare mathematically. Below is a 2 frequency dome that has been extended to form a lozenge shape, it’s not elliptical so doesn’t have complex mathematics to work out. Made from standard 2 frequency panels with a centre section that could be extended pretty much as far as you want. 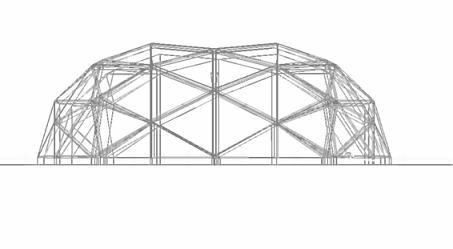 There are some issues with strength if the dome is extended more than a couple of central sections but this could easily be rectified with some support structure. Let me know what you think in the comments section below, if this design is popular I’ll do full plans with measurements. we use eccentricity manipulation, allowing up to 3x dome elongation on any *all* axels. 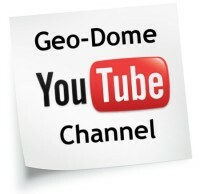 hi,, can anyone do a stretched dome not too high, 23 metres by 15 metres? I love this shape. Looks super functional. Full plans and measurements, yes please! When you say using standard 2 frequency parts does that mean this achieved with only 2 lengths? if so how many more pieces of a and b are needed. ? Good!!! I'll buy 2 by 4's for my green house. I'll be back after things done. Actually this design isn't elliptical. Stretching a geodesic is certainly a way of getting a tunnel dome - what Gravitonium calls eccentricity manipulation - but a big problem with this is that almost every strut becomes unique. 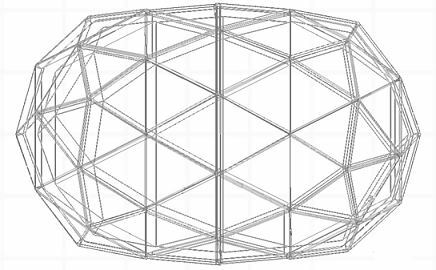 The interesting thing about this design is that there's a section inserted in the middle of a conventional dome so it's still got a lot of the advantages of the spherical geodesic, though structurally I'd expect it to perform less well then an ellipsoidal dome. I love this shape. I would love to see the plans! I just finished bulding my first 3V+ dome. I used 4 strut lengths instead of 3 to make it come flat at the base and it is gorgeous. But this elongated design that you propose really intrigues me .Do you have a dxf file to share? hello Simon, I've been gone for a long time due to many papers. 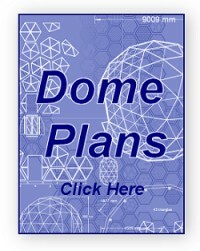 Simon, I am in dire need to make an elongated dome like this forum. height has to be 4.5 meters, width 9 meters and 15 meters long. measurements of length and width can be flexible and could increase or decrease as the convenience of calculations. I also think that the frequency can be three or four for extra strength. I'm out of time to study the construction of this structure. can you help me with the steps if you have this pre conceived? I'd love the plans for this. Do they exist? I have designed an extended trapezium, but maybe your idea is the way to go. Hi, Just left a message else where.....I am looking to make an egg shaped 'thingy' this looks close to what I need ...can it be done? smaller at one ond than the other? I have £2000 to spend. Can I do it for that? Hi there, interesting design would be interested in plans for 9metr by 6metre to cover above ground pool to extend the swimming season a little longer. That is just what i am looking for, i have a space of 2m by 6m to put it in. Plans would make my life easier when handing it over to my husband to build! This is ideal. My need is to split it longitudinally to attach half each to the south and west sides of my house (separately, halves not joined together) Thanks! I am definitely interested in plans of multiple sizes. Thanks! Hello, Another vote for full plans please! YES!!! I have spent the last hour searching for exactly this! So if I have extra support can I build this 40 feet wide and 120 feet long? I use a program called Misfit Model 3D. It is freeware for Windows, Linux and Mac. With it you can manipulate complete figures, lines and points. It can export as DXF (Bryce style). All drawings are triangulated. You can duplicate any pair of sides, and rotate them on x,y or z, so you can set up angles for measurement. Hi Paul , lovely design . 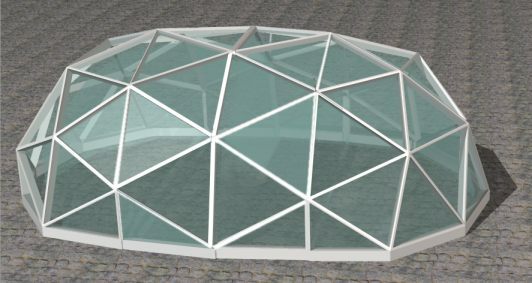 How can I do a half stretch dome with this design using steel or aluminum? Can I trouble u for a design? And also my half dome too :) thanks a mill ..